For information on the Dyfi Valley and surrounding area go to the EcoDyfi website or the Dyfi Diary website for some interesting pictures and views as well as upcoming events and places to visit. The Wales Directory also have some great information on Machynlleth. The Tabernacle Museum of Modern Art in Machynlleth – exhibitions and events, including details of the summer music festival. Five minutes up the A487 you’ll find King Arthur’s Labyrinth where your underground adventure begins deep inside the spectacular caverns of the Labyrinth and far into the past. A fascinating journey of discovery of Welsh myths and history unfolds as you explore the tunnels and caverns. On the same site Corris Craft Centre offers a wide range of unique Celtic and contemporary craftwork, including jewellery, leatherwork, pottery, rustic furniture and turned wood. There is also a café and children’s play area on site. A further exhibition – the Bards’ Quest leads you on a trail through more Welsh legends and stories. Within spitting distance (if you’re a giant!) of our tipis lies the spectacular mountain Cadair Idris. Beware! Legend has it that if you spend a night upon the mountain you’ll come down either mad or a poet! Just south of us are the RSPB bird reserve at Ynys Hir where spring watch is filmed, as well as the Ospreys at Cors Dyfi. To find out more about the beautiful Welsh wildlife, including the local Abercorris Wildlife Trust Reserve, you can visit the First Nature Wales Wildlife site. If you fancy a trip on a steam train through breath-taking scenery you’ll be spoilt for choice. Tal y Llyn railway passes the delightful Dolgoch Falls and there are excellent forest walks at Nant Gwernol. The Corris Railway also houses a small museum. Will Lloyds, award winning local butcher on the High Street. The Eco Retreats site lies in the heart of the Dyfi Forest, close to the Cli-machX Mountain Biking trail which is worth a visit for the more extreme types – Dyfi Mountain Biking will give you information about three cross-country routes that start in Machynlleth and the Cli-MachX trail. If you want to hire a bike during your stay contact Wild West Cycling (07828 639998). 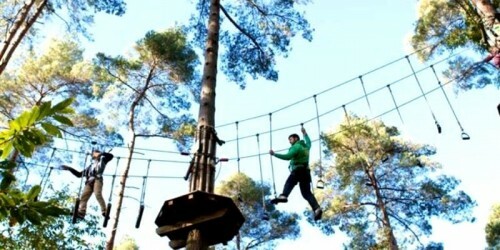 If you’ve got a good head for heights then why not try out the treetop rope course at Go Ape in Coed-y-Brenin? There’s also a forestry visitor centre there and great mountain bike trails – you can hire bikes at Beics Brenin. Local rock climber and all-round adventurer, Huw Gilbert, is happy to offer instruction and leadership for groups of two or more in rock climbing, mountaineering or mountain biking. Adventure Camps offer outdoor canoeing, climbing and all sorts of adreneline activities whilst ensuring they are sustainable and non disturbing to wildlife, they welcome families and groups. Do you enjoy walking down mountainous ravines or throwing yourself over waterfalls? If you do then you can have a go at canyoning with a local guide. The local beaches can be great for windsurfing and surfing. For a really thrilling experience why not try out Kitesurf Wales in Aberdyfi or AberAdventures in Aberystwyth who are also offering stand up paddle board hire in Borth which is a very accessible new water sport. Bwlchgwyn Farm offer lovely pony treks along the Mawddach Estuary or on Fairbourne beach.